How can the Grand Old Flag help us parent with Scripture? Celebrate July 4th beyond the burgers and fireworks by using the 13 strips of the Grand Old Flag as prayer points or Scripture strips for our nation! Display this project in your home as a reminder to continue to pray for our nation. Start by making or printing out a picture of a flag to use for either the version below. You can keep this as simple as you want or go all out crafty! Pinterest and Google Images have lots of options. 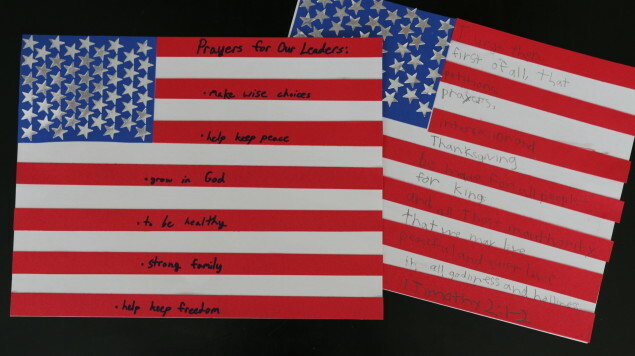 Brainstorm with your kids different ways to pray for our nation. Don’t forget, as the verse reminds us below, to give thanks as well! Write one way on each of the stripes of the flag. Write out 1 Timothy 2:1-2 on the stripes of the flag and display it in your home to help your family remember to lift our country up in prayer. Click here for a children’s sing-along of The Grand Old Flag from YouTube to familiarize your children with this patriotic song by playing it while working on the project. to help you and your kids know what God has to say about the topics! I heard a former missionary say how the American kids and teens they met internationally were almost always the least well mannered (of all the other nationalities) in greeting and talking with adults. It’s sad to me that I find myself surprised when a child or teen politely talks, has good eye contact, can carry on a conversation, and act interested in something besides themselves. We, at the Durbin household, are bumbling along with this just like most every American home. And trust me, we have much progress to make! That’s why I keep my eye out for resources to help with good manners! There are maaaany others (including free online articles, printable flash cards, games, etc), but here are our four favorites. We had fun going through these at many a meal time when my kids were little. We are still working our way through this great tool. More recently I came upon this article in the March 2014 issue of Family Fun Magazine. It’s chock full of fun, interactive ways to help teach different aspects of manners. What’s your favorite tip or resource for teaching manners to your kids? May I please rant a bit in this post? I’m sure I’ve missed an RSVP or two in my day. None of us is perfect. There is grace. However, not RSVP’ing is one of my biggest pet peeves. It’s downright disrespectful to the host(s). Please, let us teach our children the importance of RSVP’ing, in a timely manner, I might add. If you have ever hosted something, you know it is difficult and costly to plan if you don’t know how many people to expect. It might be instructive to discuss this point specifically in relation to the next party your child is invited to. I’m starting to teach my kids to RSVP for their own parties to help get them in the habit. Evites, the invite of choice these days, are a bit tricky b/c they still come to me, the parent. I have my kids help me check the calendar, type a nice note in the comment section, and write the event on the calendar as we RSVP online. This way they still experience the process. If I was only half-hearted about having my children RSVP for themselves when I drafted this post earlier this year, I’m certainly confirmed in that decision now. As one of the hostesses for a high school senior graduation party, I was horrified that only two of the invitees RVPD’d on time (or shall I say their mother’s did!) without prompting by the guest of honor. Remember, we are talking high school seniors here. I know, I know, I can hear the arguments now….it’s better for the mothers to do it then for it to not happen at all. And, you can’t make your teen be polite. True and True. But since when did we start having such a low view of what can and should be expected of our kids?! Not RSVPing is just a small symptom of a muuuuuch larger problem of low expectations and youth entitlement. Show proper respect to everyone. Who’s with me in this pet peeve? Click here for more of my Southern Hospitality Series. I grew up helping my mom deliver baked goodies to every new neighbor that moved in around us. When you grow up with something, you tend to assume that everyone does things the same way. Either time has wilted hospitality in general or it’s not as common of a practice as I had assumed. I think it’s probably both. When we moved into our new neighborhood 3 years ago, I was sort of stunned that nobody came to meet us. In fact, the neighbor that did end up popping by with a surprise and to say “welcome” was a gal I had met at the neighborhood pool. They lived several blocks over and had moved from out of state a few months before us. It was fresh on her mind what it felt like to be the new kids on the block! I now know the neighbors on our street are lovely folks! How? Instead of dwelling on my frustration of nobody making an effort to come meet us, I decided to turn the table. We had been here six months and it was New Year’s. The kids helped baked up some treats, bag them, and attach tags that said something like, “Happy to celebrate this new year with you as a neighbor!” Then, we added our address and contact information. The kids and I delivered them door, leaving them as a surprise for those who weren’t home. The response was great and it helped pave the way for future interactions and friendships. Now as new neighbors move onto our part of the block, we make our way over to meet them. It’s not about the treats or baked goodies, it’s the thought and the welcome that count! We just happen to enjoy an excuse to bake and the smiles that the yummies add to our greeting. And, it’s never too late! We weren’t sure when a family moved in at the end of our block. We has seen the “For Sale” sign come down, but never saw anyone moving or people coming and going. Months went by and we finally decided we would just go down and knock. Now it’s a year later and they are our best friends on the street! Hope this encourages you to reach out to those neighbors around you, old and new. Otherwise, you might be missing out on giving and receiving blessings! Click here to see the rest of my Southern Hospitality Series. Please share in the comment section if you have a special way you like to welcome new neighbors. 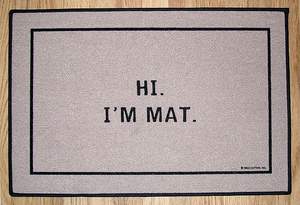 Or, share a meaningful way you were welcomed. Even though hand-writing letters is mostly a thing of the past, I hope hand-written thank you notes never go extinct! I explain to my kids, as my mother did to me, that because the giver went to the time and expense to get the gift, surely we can take the time to write a thank you card and mail it. 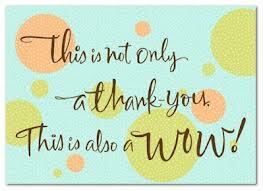 I think thank you notes go a long way in helping children not take for granted what is given to them. Anybody else have Biblical principles and verses about gratitude, thankfulness, and appreciation ringing in your ears? My mom used to save well-written thank you cards to help me as examples when writing my own. I haven’t done that (yet), but came up with a method that has been manageable for us as my kids have grown. The main time of year we require thank you notes is at birthdays. My children don’t happen to be the extra-generous types who want people to bring items to donate instead of for them. (Who are those kids?! God bless ’em!) So every year, as presents are opened, I am diligent to write (ahem, scrawl out, unless I’ve shoved the task into a friend’s hand at the last minute) the list of names and what is given. Within the next couple of days, we make a point to get started on the thank you notes. 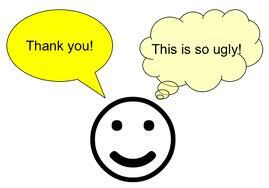 Not only is it courteous to be timely with a thank you, I find that the longer we put it off, the worse our attitudes get. I want to help foster appreciation for the gifts, not a dread of writing hanging over their heads. With the gift list and note cards ready, I mark off how many the child needs to work on per day. This depends on the age and ability of the child, as well as how many gifts were received. They love checking them off as they complete them! 1st – 4th grade – This age range can begin to use more and more of their writing skills. On the sample below, I’ve shown the progression I used with my kids. They would fill in the underlined portions and I would do the rest. With each progressing phase, we would discuss the sample and I would write out a “master” so they could use it for reference as they worked. Thank you for the game. I am going to have a blast with it! I’m glad you could celebrate my birthday with me! Thank you for the game! I am going to have a blast with it! Thank you for the game! I am going to have a blast with it! I’m glad you could celebrate my birthday with me! By this point, they should be capable of writing thank you notes on their own. Practice with them on coming up with their own thoughts for the wording. Below is the formula I use in teaching my kids. I write it out for them so they can keep it in mind as they write. I encourage at least three sentences, but remind them it doesn’t hurt to write more. Thank you for the name of item. Say something nice about the item or how you will enjoy using it. Tell them you are glad they celebrated your birthday with you or appreciate them remembering your birthday. I’d rather my kids spend their energy writing the actual thank you notes than addressing them. I wait until the writing process is not tedious and time-consuming for them before adding in the envelope portion. in Parenting with Scripture: A Topical Guide for Teachable Moments. You’ll find related Scriptures, discussion questions, and Take Action ideas to help you reinforce this important subject. Have a thank you note writing tip? Please share in the comment section!